As part of their 20 year anniversary Clark have commissioned research, in collaboration with Maynooth University School of Business, on how to attract and retain millennials in the workplace. 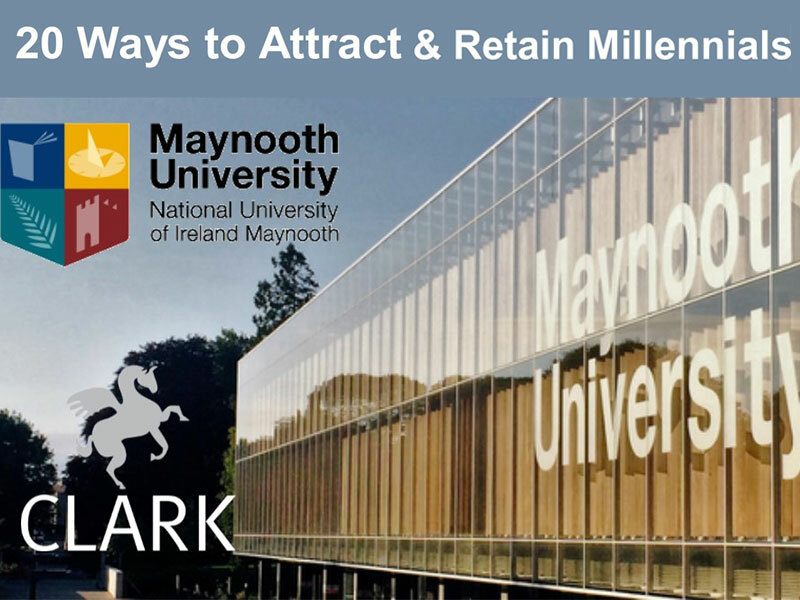 Clark Recruitment commissions research in partnership with Maynooth University on attracting and retaining millennials in the workplace. The Business Research Project, which was conducted by a Masters student, identified how Irish companies can attract, recruit and retain millennials. Millennials are those born from the early 1980’s until 2000. They are that first generation to grow up in the digital age. The research, which was titled "An Evaluation of How Employers Can Retain Millennials" has provided Clark with some valuable insights which are of benefit to any organisation who are hiring millennials or already have millennials working in their organisation. Established in 1998, Clark is a Recruitment & HR Services based in Naas, Co. Kildare. With an innovative spirit, solutions focused approach and the human touch, Clark partner with their clients to project manage Recruitment & Selection, provide HR Guidance, Managed Services and Executive Coaching. Their business is underpinned by three main qualities: professionalism, integrity and a focus on people. Maynooth University is an internationally recognised institution located 25 kilometres outside of Dublin, Ireland, and is the nation’s fastest growing university. Maynooth School of Business aims to be at the forefront of delivering innovative, engaging programmes for future leaders in the fields of business and management. It undertakes to research and deliver teaching with the aim of making a difference, and innovation underpins everything they do.